The main emphasis of Khenpo Samdup Rinpoche’s 2018 teachings at Gar Drolma will be an extensive and thorough presentation of Jigten Sumgon’s renowned text The Essence of the Mahayana (Thekchen Tenpai Nyingpo). This text presents the main stages of the path of practice in the Drikung Kagyu Tradition. It begins with a discussion of the 4 Thoughts and how to follow a spiritual teacher, continues with Refuge, Bodhicitta and the Bodhicitta vows, and concludes with a presentation of the Vajrayana, including the stages of the Five Fold Mahamudra. Khenpo Samdup Rinpoche has composed and published a commentary on this classic text and will be using it as the basis of his explanation. This book can be purchased here. After completing the Essence of the Mahayana teachings, Khenpo will give two weekends of teachings on The 37 Practices of a Bodhisattva. This text explains the path of mind training in the Mahayana tradition in 37 beautiful verses. Garchen Rinpoche constantly references this text and asks his disciples to read, contemplate and meditate upon its meaning. These teachings will also be offered via live stream as a single online course. Those who register for the course will receive private links for live streams of the teaching events (including empowerments). At the conclusion of the month’s teachings video recordings will be uploaded to a password protected site to which subscribers will have unlimited access. Video recordings of the teachings will only be available to course participants and will not be available publically on Youtube. Each topic will also have a discussion forum dedicated to it. The forum will be moderated by a senior student and allow participants to discuss the teachings and ask questions. Khenpo Samdup Rinpoche will reply to student questions. Access: Teachings are accessed online either via live streaming, or as archived videos. See schedule below. 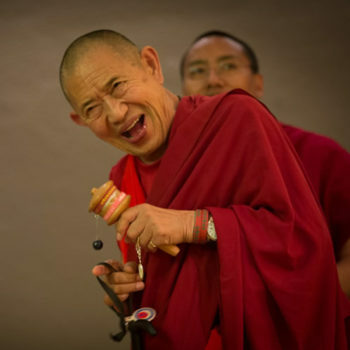 Q&A about the practices that will be answered by teaching assistants, Khenpo Samdup Rinpoche or Kyabje Garchen Rinpoche, depending upon the nature of the question. Those who signed up for the 2017 Stage of Meditation Online Course may continue to access it by logging in here. BOTH curriculums will be available, depending on what you have signed up for. the Essence of the Mahayana Online Curriculum.